Itrazole (Itraconazole) is a synthetic triazole antifungal medication indicated for the treatment of fungal infections. It works by inhibiting the synthesis of ergosterol that is dependent on cytochrome P450. As ergosterol is a key component in the membranes of the fungal cells, the lack of it results in damage to the cell membrane. This causes the vital constituents of these fungal cells to flow out, resulting in the destruction of the fungi and the eventual clearing of the infection symptoms. 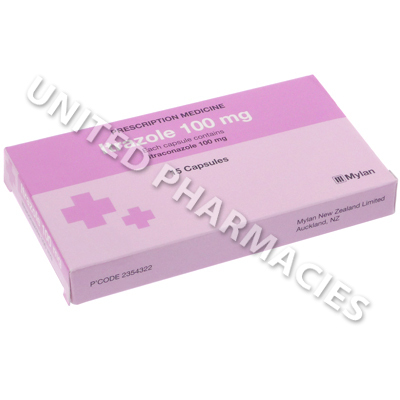 Itrazole (Itraconazole) is a synthetic triazole antifungal medication indicated for the treatment of fungal infections. It works by inhibiting the synthesis of ergosterol that is dependent on cytochrome P450. As ergosterol is a key component in the membranes of the fungal cells, the lack of it results in damage to the cell membrane. This causes the vital constituents of these fungal cells to flow out, resulting in the destruction of the fungi and the eventual clearing of the infection symptoms. Conditions treated include fingernail and toenail infections, vaginal yeast infections caused by candida, fungal keratitis, superficial dermatomycoces, pityriasis versicolor and other types of infection. 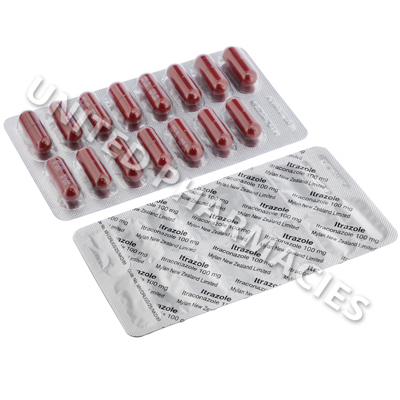 Itrazole (Itraconazole) is supplied as 100mg capsules which are administered orally. The dosage that is required will need to be tailored to your individual needs and deciding the correct amount of medicine to be taken is the responsibility of your doctor. Some adult patients who are undergoing treatment for tinea that affects the body or groin may be directed to take 100mg (one capsule) once per day for a period of 15 days or else 200mg (two capsules) per day for 7 days. Systemic infections may require 100mg to 200mg taken once or twice per day for a period which can often range from 3 weeks to 8 months. The dosage for fingernail or toenail infections is usually different and patients may be prescribed a treatment schedule which requires taking the capsules for a specified period of time after which a break from treatment is required before recommencing treatment and stopping again. Because each patient's circumstances are different, the dosage will usually vary from patient to patient. Therefore you must only take the amount of medicine that your doctor tells you to take. Any side effects which bother you should be reported to your doctor. Although it occurs less frequently, there is still a risk of serious side effects. You will need to consult your doctor as soon as possible if you experience a painful sensation when urinating, hearing difficulties, fever or any other symptoms of a serious reaction. If you notice any unusual sensations affecting the feet or hands, this could be a sign of peripheral neuropathy. See your doctor straight away if this happens, as you may need to stop treatment. This medicine may cause congestive heart failure. If you have a history of heart failure, it is possible that your doctor may tell you not to take this medicine. Any other serious health problems should also be reported to your doctor. Always use Itrazole (Itraconazole) as you have been prescribed by your doctor. Never self-medicate or change your dosage without first consulting your doctor. The correct dosage can vary depending on your health, medical history, and the severity of the condition being treated.